brings true relaxation to the world. She uses revolutionary technology that gives you rolling, tapping, kneading deep tissue Shiatsu massage, and even makes simultaneous triple-function a real joy. Feel free to lay down flat, or relax to 190 degrees. Allow her comfort you, and later she will wake you up by gentle massage. Kneading for calves or feet with footrest flipped up Rolling for foot soles with footrest flipped down Pre-programmed auto functions to ease the operation. allows up to 30 minutes massage. to awaken you with nice massage. 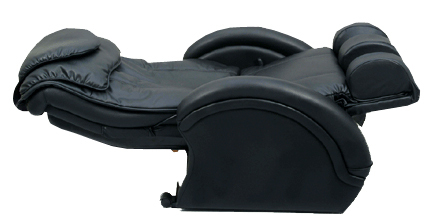 to allow footrest recline and operate independently. to massage from head, neck, shoulder, back, waist by rolling, tapping and kneading. and unlimited roller width adjustments. Three levels of heat option. to make it as a regular recliner. covers seat, back, pillows, armrests and footrest. allows flexible head height adjustment.